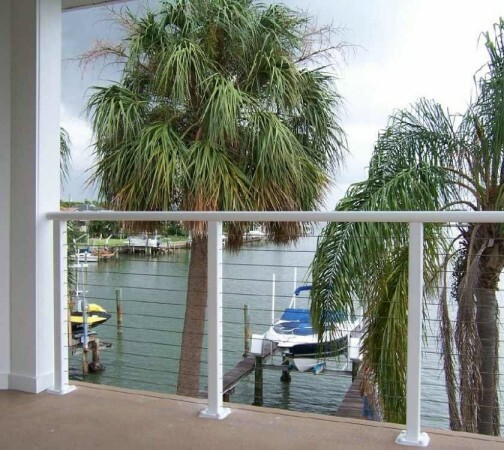 The AP1-2000 cable railing system is our aluminum cable railing system. The aluminum offers a cost savings and a choice of color. The posts are a 2 3/8" square profile. The top cap is a 3 3/4" × 2" oval profile and attaches to the vertical post mechanically so no welding is necessary. The cable infill system consist of (13) horizontal layers of cable for a 42" high rail and (11) layers for a 36" high rail. The cable system is a 1/8" 1×19 dia. cable with adjusters at each end of the cable for tensioning. This system can be surface mounted or fascia mounted. The standard finish is a marine grade primed and powder coat finish to customer’s choice of color.